In 2011, scientists at the Sahlgrenska University Hospital of Gothenburg applied a method of bioreactor-engineered trachea (similar to that by Macchiarini) to operate on a 76-year old patient, possibly without a medical necessity (he had asthma since decades). The patient died 23 days later “due to cardiac arrest but with a patent, open, and stable tracheal transplant and intact anastomoses”. This is what the paper (Berg et al, Tissue Eng Part A. 2014) claims, which last author is Suchitra Sumitran-Holgersson, professor of transplantation biology at the Sahlgrenska Academy. The University of Gothenburg described Sumitran-Holgersson as “genius”, in an article presenting her rather unconventional method of purifying endothelial stem cells from patients’ blood. That work she did in collaboration with another Sahlgrenska professor and medical director of the Transplant Center, Michael Olausson. “The patient transplanted acquired his problems 34 years previously after a trauma. The patient and the daughter wanted the procedure and the patient consented the procedure – he did not want live in the present conditions”. First of all, patient’s and his family’s consent does not liberate Sumitran-Holgersson and Olausson from their responsibility to apply the best possible and the most reliable therapy, as opposed to testing novel experimental approaches despite the possibility of safer alternatives. Also, it is quite possible that after 34 years this patient was not a “compassionate case”, where no “conventional” therapies were applicable to save his life. This might have justified the testing of experimental therapies of a “bioreactor”-engineered trachea. In fact, Macchiarini is accused of having misrepresented the true medical state of his patients to justify compassionate case therapies. In one case he insisted his transplant recipients had cancer, while evidence of a stable and cancerless condition was seemingly suppressed. Thus, the Gothenburg case might even have been similar to Macchiarini’s operation on the patient Yulia T. in Krasnodar, whose clinical condition was anything but imminently life threatening and who, prior to giving her consent, apparently assumed to be undergoing a kind of cosmetically surgery, after a car accident left her with an painful hole in her throat (case summary in Russian here and SVT video in Swedish here). Also this decision to operate was apparently approved (via video-conference) by the Swedish doctors, from the Karolinska Institute (KI). “The patient died. The new information was the result from the autopsy which showed a very good recellulirized trachea (Berg et al). The paper was difficult to publish due to the Macchiarini group was reviewing the paper. It was considered unethical to publish this case since it might destroy the whole field of tissue engineering”. Also, an apparent image duplication might be suggesting that the donor trachea was possibly not thoroughly decellurised by Sumitran-Holgersson and Olausson, before it was transplanted into the patient, who then died just 3 weeks later. In fact, a growing number of publications by Sumitran-Holgersson as last and corresponding author are being flagged on PubPeer for image duplications and suspected data manipulation. Several of them feature Olausson as co-author. “What is being done in Gothenburg is not an investigation due to suspicion of research misconduct, as was the case at KI, but an internal investigation based on a joint initiative between health care and university with the intention to assess in every detail what was done with respect to the transplanted trachea and the actual vein grafts, and secondly to analyze what to learn from that. In the end, the goal is to develop procedures for work in the boundary between clinical research and medical care. Professor Olle Lindvall, who is to lead the process to assess similar issues under the Royal Academy of Sciences, and professor Kjell Asplund, who is to lead the investigation on the parts of the Macchiarini affair that took place at the Karolinska Hospital, are loosely associated in order to validate the process”. “It is incredibly important that we investigate all aspects of this. It is also important that the suspicions against one or more researchers are not the same as a conviction”. According to Swedish regulations, after the ongoing internal investigation it will be up to Fredman to report the case to the Swedish Central Ethical Review Board (CEPN), which would then initiate an official external investigation. Then, science can start self-correcting itself. Except that Swedish science already tried self-correcting with Sumitran-Holgersson and got a bloody nose, and the story of how this happened is much more bizarre that that of Macchiarini. The latter was found guilty of misconduct by Gerdin’s institutional investigation at KI, while afterwards the (now sacked) Vice Chancellor Anders Hamsten chose to declare Macchiarini innocent and not to forward the case to CEPN for investigation. The Macchiarini status is of course different now, as I reported. Yet Sumitran-Holgersson was already extensively investigated for research misconduct between 2009 and 2011 by the highest Swedish investigative authority at that time (and now solely funding agency), the Swedish Research Council Vetenskapsrådet (VR). She was found guilty of research misconduct and data manipulation by the VR’s own investigative expert team, but nevertheless fully exonerated afterwards. The information below was provided to me by a reliable source (whose true identity I am aware of) and independently confirmed in comments and emails by other readers of my blog. Sumitran-Holgersson used to work at Karolinska Institutet before moving in 2008 to University of Gothenburg. In 2009, three her former students reported her for misconduct to the then-KI Vice Chancellor Harriet Wallberg-Henriksson , who is also a member of the Nobel Assembly. After an internal investigation, Wallberg forwarded the case to VR for investigation, which then appointed two scientists as investigators, Olle Kämpe, professor of molecular medicine, and Lena Claesson-Welsh, professor of vascular biology, both at Uppsala University. As the investigation progressed, the two have found a number of data misrepresentations and falsifications. For example, they determined that Sumitran-Holgersson presented at a midterm PhD seminar a table from a manuscript, where the number of samples suddenly increased from n=1 to n=3. This happened overnight, simply by addition of standard deviations, while the mean value of every single one of the 17 measured flow cytometry (FACS) parameters stayed the same (original evidence available here). Sumitran-Holgersson claimed that she did not manipulate this Table 1 prior the midterm PhD seminar, but that she instead herself performed the two additional experiments. In an email from 11.05.2009 she informed the Research Council (VR) that she has provided the raw data in question. On May 13th FACS histograms from two experiments labelled 080616 and 080628 arrived and were duly registered at VR. However, the two FACS scatter-plots representing separate experiments were identical down to every single pixel. A strange date “090226” was stamped on the histogram analysis for the cell surface marker CD45, supposedly performed nine months earlier. In a reply to the preliminary investigators’ report dated 18.11.2009, Sumitran-Holgersson added 102 different attachments. Among those were the attachments Nr. 31 and 33, which resembled the FACS histogram from May 2009, only that this time the date “090226” disappeared and the scatter plots now looked fuzzy. Later on, on 18.05.2010, a former PhD-student of Sumitran-Holgersson’s discovered files named “VR1new”, “VR1” and “VR2”. The date stamps of these experiments did not match the dates when these files were first created, according to the file directory. Welsh and Kämpe were called to KI’s Department of Clinical Science, Intervention and Technology (CLINTEC) in Huddinge, where Sumitran-Holgersson used to work. There, the investigators asked the IT responsible to create a copy of the hard disk. The copy was left at Huddinge and the original hard disk brought to Uppsala to be kept in a safe in until further analysis. This analysis was later performed by IBAS, a Norwegian company specialized in IT forensics. IBAS were unable to detect any manipulations of the data on the hard disk. When the files were subsequently analysed, it emerged that the FACS files came from three completely different experiments for completely different stainings and conducted by an unrelated researcher on 18.11.2008, 24.03.2009 and 26.03.2009. When Sumitran-Holgersson originally submitted these files to VR, all the date stamps turned out to have been covered up by white rectangles, which also explained why some numbers were only partially visible in the histograms. This information is evidenced in the report by Kämpe and Claesson-Welsh, which was submitted to VR and to the then-Dean of Research at KI, Martin Ingvar, on 07.11.2010. Well, whatever happened to this letter and its attachments at KI, here it is, at least in part. Based on the investigative report, the Vice-Chancellor Wallberg-Henriksson decreed that Sumitran-Holgersson committed scientific fraud. The entire 27-pages-long final report from the VR (in Swedish), dated 9.09.2010, is available here. Sumitran-Holgersson was to be banned from VR funding for 10 years. A paper by Sumitran-Holgersson in (Elsheikh et al, Blood 106 (7), 2005) was retracted in May 2011, with the retraction note stating “that the results as published cannot be considered reliable”. “I recruited Suchitra Holgersson from KI and wanted to be absolutely certain that she was not cheating. I succeeded in getting hold of backups from USB and computers and could see that the files had been edited. Using freeware I could see that files in a folder/catalogue had been renamed – but the time for their analyzes stated the right order. When the files are analyzed they are given a date and time stamp followed by an order .001, 002 and so on. I bought professional forensic computer software (Knoll) and put down more than 1000 hours of work”. Yet, the direct evidence of deliberate data manipulation, namely data duplication and its re-use from an utterly unrelated experiment was provided by none other than Sumitran-Holgersson herself, upon request of the two investigators. Kämpe and Claesson-Welsh, never had any conflict of interest when investigating Sumitran-Holgersson, unlike her close collaborator Olausson. “Since I use similar devices on which the fraud was supposed to have been carried out, I became interested and began to examine the case. My conclusion was that there was no evidence that there ever was any cheating”. A certain journalist named Sus Andersson also became involved. She got direct access at VR to all the documents and posted her investigation on the website FARAD!. Andersson and the Gothenburg professors insisted that the investigation did not suffice the Swedish guidelines for transparency, since some of the investigation’s documents have not yet been registered and made public right when they were first submitted to VR. This was their main argument, because Swedish law demands that every single official document must be publicized immediately. And we are talking about thousands of pages, with copious (yet, as I was told, hardly informative) statements by Sumitran-Holgersson and mutual accusations between opposing fractions at Karolinska and Gothenburg. Thus, the whole investigation became invalid regardless of its actual findings, just because not all of its documentation was stamped and published right away. Also, in Sweden the whistleblower’s confidentiality is not protected by law, quite the opposite: the identity of the whistleblower must be released to the scientist accused of misconduct. Instead, the investigators tried to shield their informant, who was an employee of Sumitran-Holgersson, from repercussions. This was also held against the investigation as evidence for its allegedly insufficient transparency. “Suddenly whistleblowers had to prove that they are not guilty, that they had no personal reasons, that they did not get any benefit from the case and so on and so on. Finally , when number of documents exceeded any reasonably readable amount, the case was done: it was indeed impossible to understand who did what and when and why”. After the conclusion of the investigation the Vice-Chancellor Fredman initiated a procedure to sack Sumitran-Holgersson from the Gothenburg University. As Agnes Wold, professor at the Department of Infectious Medicine, University of Gotheburg, commented on my blog, this was met with the demands by Olausson, Stenqvist and Haraldsson that Fredman herself is to resign or be dismissed instead. They made their demands public, in the Swedish evening paper Expressen/GT. The pressure from Gothenburg professors, plus Andersson’s reporting, made the Swedish authorities to turn against their own investigation. It was completely and utterly dismissed as nil and void in a decision from 24.10.2012 by VR’s investigative successor, CEPN, signed by Johan Munck, former chairman of the Supreme Court of Sweden. The file is available on FARAD!. The legally irrevocable and binding decision was obtained after only one and a half hour interview with Sumitran-Holgersson, seconded by Elias Eriksson, while neither the whistleblowers, nor the investigators were called to give evidence. In fact, CEPN did not even bother to obtain all the documents from VR, such as the binders containing the analysis of the FACS files in question or any other documentation. Ironically, CEPN acknowledged that Sumitran-Holgersson did indeed fabricate the evidence which she provided to the expert investigators, but this was deemed irrelevant since that fake research data was not intended for publication. The VR Director-General Mille Millnert declared in Dagens Nyheter that the investigators “overstepped their mandate”. Hellstrand and Haraldsson made sure Sumitran-Holgersson got all the VR funding back, which was taken away from her, as Wold commented. Now CEPN will be investigating and deciding about scientific misconduct and patient deaths connected to Macchiarini. In fact, the journal The Lancet announced to me in an email only to consider responding to harsh criticisms of Macchiarini’s publications, once CEPN has “reached a verdict”. Good news for Macchiarini, given the Sumitran-Holgersson precedent? Maybe not, since CEPN has a new leadership now, primarily Karin Almgren, the Justice of the Supreme Court,. Almgren used to be the chairwoman of the “Oredlighetsgrupp” at VR, which originally appointed Welsh and Kämpe and found Sumitran-Holgersson guilty of scientific misconduct. Ongoing grant of 1 Mio SEK from Hjärt-lungfonden (Heart-Lung foundation), apparently to grow an artificial heart from stem cells. Ongoing grant of 2.1 Mio SEK from VR, “Native extracellular matrix as scaffolds for tissue-engineering of pancreas with human stem cells”. Ongoing grant of 2.5 Mio SEK from the IngaBritt and Arne Lundberg Research Foundation, “to purchase a bioprinter that can recreate tissues such as blood vessels and liver tissue, as well as body parts such as ears and noses”. In the event the FDA should act in error because of VR inquiry in terms of the XM-ONE’s approval, this could result in significant economic damage to Absorber, which made major investments in the product and the marketing and sale of same. If someone knowingly mislead the FDA in this question, Adsorber will be compelled to claim compensation against the person concerned. Such claims may amount to a very significant sum”. Basically, Karlsson stated that Holgersson’s biotech company will sue everyone who dares to discredit his wife for all they have and much more, as “compensation” can easily mean millions of dollars. And he did not target his threats at the mighty Swedish authorities. In fact, as a VR lawyer told Kämpe and Welsh, they would be on their own against Absorber. No legal protection or assistance at all would be provided by VR. One can understand that Kämpe and Claesson­Welsh felt somewhat pressured in their investigations. After the Macchiarini and Sumitran-Holgersson cases I really start to wonder about the feasibility of reporting and sanctioning of scientific misconduct in Sweden. A whistleblower must be career-suicidal, as his or her name will be officially served to the reported fraudster (who is often whistleblower’s own superior) on the silver platter. An investigator must be either a naïve idealist or a masochist, who does not mind seeing own name dragged through mud and threatened with lawsuits, all for the crime of actually doing one’s job thoroughly. Maybe this is why Sweden has such an admiringly low incidence of scientific misconduct. On the first issue Millnert states: “Registration and filing of documents pertaining to the investigation are inadequate or non-existent. Minutes from the expert group meetings after March 2010 until the end of the investigation in September 2010, missing. Not even the final decision meeting were protocolled or archived with VR”. is Vetenskapsradet considering […] to withdraw at least the running funding to Prof. Sumitran-Holgersson? “It is the responsibility of each researcher to demonstrate the original data to support des conclusions and claim it for the front .The documentation of the scientific work of Suchitra-Holgersson’s research group has been very weak and in several cases superficial and, to the extent it happened at all, often done with the use of loose-leafs and not in the prescribed bound laboratory diaries. These deviations from good research practice has prevented a meaningful analysis of the authenticity of some data, but the shortcomings are so serious that they must be considered as a form of scientific misconduct. The manuscript (Elsheikh et al. 2008) seems to have been improved with the addition of fabricated distribution measurements. This procedure involves scientific misconduct. To the manuscript originally compiled by Berglin a long list of improvements has been added, which cannot be substantiated with documentation, while it emerged that there never was a sufficient amount of serum available [to perform the described experiments, -LS]. 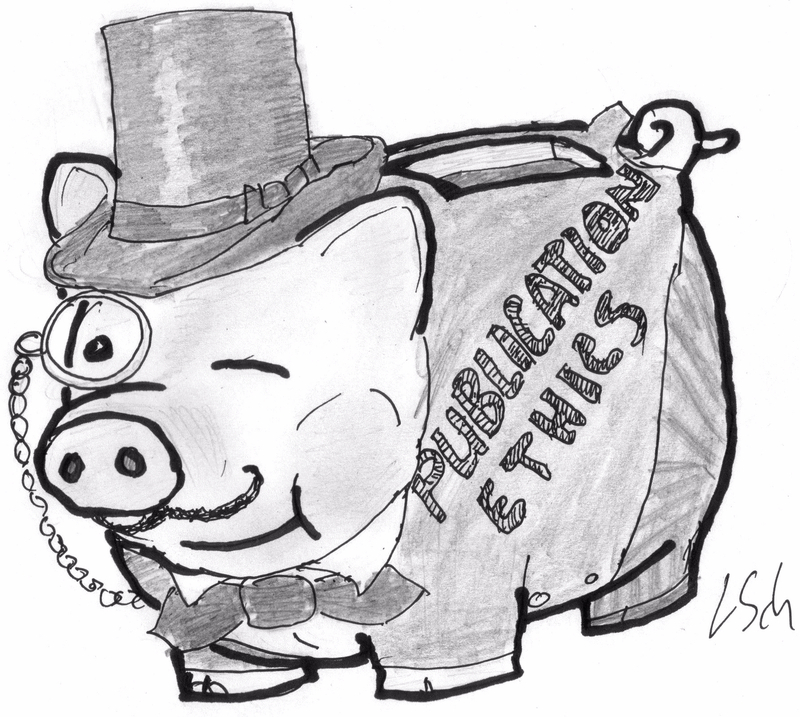 This represents, in our opinion scientific misconduct. Overall, we find serious deficiencies in the documentation, and lack of critical thinking and a sound scientific approach in Holgersson’s research, and the pattern has also continued in the ongoing investigation with the arrival of damning manipulations of research documentation. We also find it proven that in several cases have been clear fabrication of data. What we’ve found here is very serious deviations from good research. We therefore believe that there are strong reasons to investigate all research coming from Professor Suchitra Holgersson’s team over the years”. Despite laudable transparency laws, this does rather smell of herrings that would best be disposed of. There is also a very strong case here for anonymity. Bottom line is vested interests will always close ranks and it takes a huge amount of effort to break through. “It was considered unethical to publish this case since it might destroy the whole field of tissue engineering”. He magically equates self-interest (revealing facts that may cause problems for me and my colleagues) with the pubic interest (the good of the entire field). However, it is generally in the public interest for the public (otherwise known as the pool of disposable patients) to know the truth rather than have it filtered by interested parties. I think its fair to say that institutions that develop a culture of cover-up of inconvenient facts generally become corrupted from the inside and do more harm than good. Open debate (and an open society) may be messy, but its better than the hubris of secrecy. How much this applies to the scientific community is illustrated by the multiple revelations of questionable and even dangerous science that has been spurred by PubPeer. that this his would have caused problems with continuing on patients with plastic as Maccharini was clearly doing? The paper outlines severe tracheal stenosis, discomfort and pain for the patient but indeed does not describe as I read it an immediate life threatening situation. Nevertheless ”The Swedish Medical Products Agency was informed and approved this surgery according to “hospital exception.” So I wonder what evidence they used to give the ok on an experimental procedure? The case of Holgerrson showed how in principle any fraud investigation can be destroyed. Police has professional detectives trained many years, supplied with lawers, legal protection, very detailed routines and rules for documentation, interrogations, evidence collection and storing. When University or VR appoints usual professors to evaluate fraud accusations they are experts in the field but forced into action more suitable for professional criminal investigators. Tose researchers who commit fraud will certainly invest a lot of time and effort to fabricate additional evidence. Experts must by definition deal with that as well. One can be 100% sure that they will never provide the same kind of quality as professional investigators and then their investigation can be declared as not valid. In case of Holgersson it worked perfectly- first VR investigation was declared invalid when measured using the same standards as for professional criminal investigations. Every time University or state funding agency performs fraud investigation the investigators are amateurs. They confrant well trained professional criiminals with years of experience. Stealing state funds using fabricated papers must be crime, right? Imaging doping in sports would be investigated by professional sportsman from the same sport. He/she could possibly be excellent in high jumping (transplantology) but not in making investigations. Also ask him to work without laboratory to study analyses, under risk of being sued and basically force him to stop own training (research) for several months or even years. It is ridiculous but that is what happen in science. In other hand, it is obvious that “research police” is impossible. One would need to keep professional investigators for every branch of science. It is not a problem of Sweden though, it is general problem of modern science. “Improving” results to increase chances for high profile publictions (and funding) is never punished and very common. In order to be revealed, fraud must grow into absolutely catastrophic scale. Little smarter cheater will never go so far. It is gray zone of science. When competition for state funding becomes more and more extreme, some “doping” used by certain scientists can be highy efficient instrument not only to win the competition but also to eliminate honestly working (and not funded) concurrents. Likewise Arvid Carlsson, Swedish winner of the 2009 Nobel Prize in Medicine, together with Elias Eriksson and Kristoffer Hellstrand recently argued that the entire direction of the Karolinska Institute should resign, as a kind of “housecleaning” to ensure that these people no longer have any responsible positions. University of Gothenburg must act likewise. Ironically, Elias Eriksson and Kristoffer Hellstrand have recently been appointed to two of the highest positions regulating/facilitating collaborations between University of Gothenburg and the Sahlgrenska University Hospital. If Suchitra Holgersson is found guilty of scientific misconduct, their track is identical to Anders Hamsten’s, the former vice-chancellor of the Karolinska Institute who had to resign. It would be highly appropriate if they stand down during the investigation of Suchitra Holgersson to avoid any doubts whether they could influence the new investigation of scientific misconduct. Interestingly, both Kristoffer Hellstrand and Börje Haraldsson were vice-deans at University of Gothenburg when they succeeded to discredit the investigation of Suchitra Holgersson. Thus, there are many similarities between the cases at Karolinska and University of Gothenburg. “These issues should instead be treated by the initiative universities or in court, which also gives the opportunity to appeal”. There are no courts which will take research fraud cases and, as always, there must be investigation before the court. So, it is only University now left alone to make investigations. But they will get the same problems with amateur experts-investigators. There is no legal base for fraud investigations. Only USA provide some trials for state funded research fraud cases, but this was ever tested only two or three times. Actually, VR has another director now, Sven Stafström, and they have changed a lot in their policies for fraud. Note that new director actually canceled Macchiarini’s grant and VR did not returned it back even after Macchiarini was excused by KI. “Research fraud can never be tolerated”. Suchitra Holgersson case is good test for this statement. However, it is also written that some independent organization should take care of fraud investigations. In principle, not bad idea but this independent organization so far do not exist. The only remaining organization which can actually make investigation is University where the accused researcher is employed. Why do any experiments if you have an amazing image bank? They may contradict your brilliant ideas. The extreme transparency of the Swedish system offers interesting possibilities, in addition to putting whistleblowers at risk. In most investigations, the original data are treated like state secrets and the public has to trust the investigation committees, who, it seems are sometimes not totally convincing… If all the original data must be officially recorded and made public, it should be a whole lot easier for interested and expert scientists to check things for themselves. Some more thinking about the case. If some coal company sponsors research on global warming it will not be very much trusted when sponsored researchers find that CO2 has no effect at all. Universities and funding agencies really want research to be connected to applications and encourage scientists to take patents , to start own companies and to become…well, businessmen. If this new businessmen invested own money and expects high incomes from his company: what are the chances that his new research will be strongly biased to serve financial interests? It was written once that Macchiarini had patent for his bioareactors and possible connections to the company which was selling them. At least the cost of shares for this company was very much dependent on state of Macchiarini’s affair. Here we have similar case- Holgersson family, as it looks, had some direct financial interests connected to their research which resulted in treats to investigators. Thinking second time- is it actually good if academic researchers open own companies and promote own financial interests using state funding? One could argue that useless products would not sell. But most of tech startups do not sell products, they sell patents and to sell it one need to provide evidence that they worth something. Here some research papers can actually be very useful. I wonder if it could be good idea for journals to add some staments of commercial interests in the end of research papers. Like …” ths research has connections to commercial interests of (name of author) in this company (name of company). Ang. inkomna frågor och begäran till Vetenskapsrådet. Se dina tidigare frågor nedan. Vad gäller begäran om utlämning av handling sekretessprövas detta ärende nu och vi återkommer. First, please kindly provide an explanation why the 2011 investigation into Prof. Sumitran-Holgersson’s misconduct was dismissed, her position and even her funding restored, while the Vetenskapsradet apparently participated in the legal threatening of the investigators Olle Kämpe and Lena Welsh. Apparently, the reasons to dismiss the investigation’s findings were of minor bureaucratic and utterly non-factual nature, while there seems to have been some pressure from the media to exonerate Prof Sumitran-Holgersson. My second inquiry therefore is: is Vetenskapsradet considering to initiate another investigation, and especially to withdraw at least the running funding to Prof. Sumitran-Holgersson? Vetenskapsrådet svarade den 9 mars 2016 på dina två frågor ovan. Svaret på din första hänvisar vi till den bifogade filen som du fick ”Bakgrund till beslutet att dra tillbaka utlåtande om oredlighet i forskning”. Vi kommer inte att översätta tidigare bifogad fil till engelska. Vetenskapsrådet svarade även på din andra fråga i vårt tidigare mejl. Vetenskapsrådets uppgift är att fördela medel och stödja den kvalitativt bästa forskningen. Uppgiften att utreda forskningsfusk ligger däremot enligt högskoleförordningen på det lärosäte där den eller de forskare som misstänks för fusk är verksamma. I detta ärende är vi medvetna om att det finns en anmälan hos Göteborgs universitet mot professor Holgersson och vi följer ärendet. Observera alltså att det inte längre finns en expertgrupp vid Vetenskapsrådet för utredning av misstankar om oredlighet i forskning. My request of the Kämpe/Welsh official report to VR on Sumitran-Holgersson’s misconduct is being evaluated for issues of secrecy which might prevent its release. “VR task is to allocate funds and to support the best qualitative research. The task of investigating research misconduct is not with VR, but with the Higher Education at the university where the researcher who is suspected of cheating is active”. VR is “aware that there is an investigation in Gothenburg against Professor Holgersson and VR is following this case”. To have investigations separated from funding organizations is itself good idea I think. However, it is stated that CEPN investigates things only by request from Universities. I guess it will take about 1 year for Gothenburg University to make own investigation and no doubt Suchitra Holgersson will produce several millions of documents to make it even longer. If Universities are not interested to expose own problems (KI-Macchiarini case), there is little chance the issue will ever be forwarded to CEPN. No pressure from mass media is observed in this case either. Except for this blog may be. Concerning access to Kämpe/Welsh investigation: they obviously provided these documents to Sus Andersson, some scans with dates are found in her publications. Names of whistleblowers are also found in open sources. What could be the purpose of secrecy in this case? Google translate does a pretty good job, but here’s a little more correct version, sometimes the terse wording of Swedish legal text confuses the automatic translator. Regarding received questions and requests to the Research Council. See your previous questions below. As regards the request for the extradition of document secrecy examined this matter now and we will return. Your request for the release of the document is now being “confidentiality reviewed” (ie if it should or shouldnt be classified as confidential) and we will get back to you. First, please kindly Provide an explanation why the 2011 investigation into Prof. Sumitran-Holgersson’s misconduct was dismissed, her position and even her funding restored, while the Swedish Research Council apparently participated in the legal threatening of the investigators Olle Fighter and Lena Welsh. Apparently, the reasons to dismiss the Investigation’s Findings were of mines bureaucratic and utterly non-factual nature, while there Seems to have been some pressure from the media to exonerate Prof Sumitran-Holgersson. My second inquiry there fore is: Swedish Research Council is considering to Initiate another investigation, and especially to Withdraw at least the running funding to Prof. Sumitran-Holgersson? Research Council answered on the 9th of March 2016 your two questions above. The answer to your first [question] we refer to the attached file that you received “Bakgrund till beslutet att dra tillbaka utlåtande om oredlighet i forskning [Background of the decision to withdraw the statement of misconduct in research]”. We will not translate the attachment to English. The Swedish Research Council also answered your second question in our previous email. The Research Council’s task is to allocate funds and support the best qualitative research. The task of investigating research misconduct is according to the “Higher Education Regulation” on the University where the person or researcher who is suspected of cheating are active. In this case, we are aware that there is a report filed at the University of Gothenburg against Professor Holgersson and we are following this case. Please note therefore that there is no longer an expert at the Swedish Research Council for investigation of suspected misconduct in research. The translation seems to have given you the correct interpretation. “Thank your for contacting us about double publishing of figures by Suchitra Sumitran-Holgersson. We agree with you that some parts of figures first published in Scandinavian Journal of Gastroenterology later were used in another publication. We have written to the author about this, but will not do anything more about it. After all, the pictures used twice only made up a minuscule part of the figures, and we do not find this error of such a degree to do anything more”. Personally, I am more and more perplexed by the attitude to scientific misconduct in Scandinavia. Is this some misunderstanding of the concept of liberty and tolerance? And so is the publisher, Taylor & Francis. So we can conclude that figure duplication is a miniscule ethical issue for this editor, journal and publisher? With such liberal attitudes, no wonder the literature is so corrupted. Leonid, are you aware of old story about Professor Jon Sudbø ? Most famous fraud case from Norway. Lancet was also involved there. The guy published tens of papers with non-existing data and suvived like that for many years. Almost all his family members were included as co-authors. Absolutely bizarre story. Peer 1, not bizarre at all. But uncommon. I should add that Prof. Ćurčić has still not been corrected, or retracted. Welcome to the world of the powerful corrupt elite, where business and academia has made a superb marriage. Fortunately, the new editor board and EIC seem to have built a conscience, and have retracted at least 16 papers at the end of last year, but it is time to revisit that case, because the Archives of Biological Sciences still contains plenty of problematic papers. Expect wave 2 soon. New one for me – are the pre 2005 papers secure or simply there because of the laxity of journals? I cant really explain it – I’m as baffled as you are of their total ambivalence, and as a Swede I’m also furious and ashamed. But yeah, our “Scandinavian” culture when it comes to misconduct is usually bad, until there is public outcry (ie the Machiarini documentary was needed to get the process going). Usually the conduct is to try and appease powerful figures and entities, along with convincing ourselves that “although this is a serious matter you bring to our attention we will resolve it in an non-confrontational way, because surely no one would have bad intents and fraud on their mind” Its like we cant get it into our skulls that there are serious problems, mistakes, fraud and deception with ill intent in the world. And they will use their assets to not be found out. Especially when its large companies or universities with large amount of funding that is implicated. Today SVT1 reports about Suchitra Holgersson case. Hopefully it will be reposted by other news portals. Very good example of PubPeer efficiency by the way. First PubPeer, then bloggers, finally mass media. I hope that external pressure will help again, like in Macchiarini case. Leonid recently provided links to original Kämpe/Welsh VR report. It looks like one figure was used in this paper for two different things. As we know now the publication of duplicated images become good tradition for Holgersson in following years. I really wonder how these guys from Göteborg could defend that type of scientist and even to take risk of making new publications with her. Michael Olausson was aware of this report and anyway defended Holgersson. Now he is also co-author of several papers with duplicated figures. 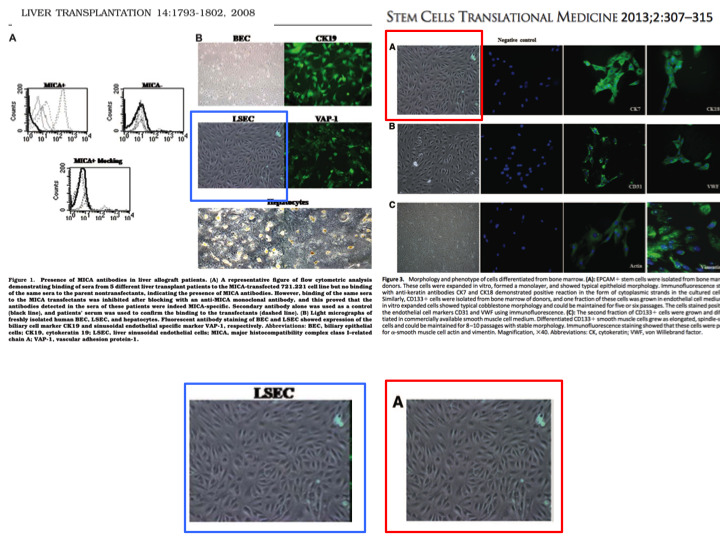 Sumitran-Holgersson’s paper on “regenerated” trachea is retracted at Tissue Engineering Part A. I informed on March 3rd the journals Editors-in-Chief Antonios Mikos and Peter Johnson about the suspicions raised on PubPeer, yet received no reply. It is the very paper discussed above where an elderly patient suffered death from infection shortly after this operation. The Editors of Tissue Engineering are officially retracting the published article entitled, ‘‘Replacement of a Tracheal Stenosis with a Tissue-Engineered Human Trachea Using Autologous Stem Cells: A Case Report,’’ by Berg M, et al., Tissue Eng Part A; 2014;20 (1/2):389–397; DOI: 10.1089/ten.tea.2012.0514. The corresponding author, Suchitra Sumitran-Holgersson, of the above-named article contacted the Editors via email to ask for a figure in the article to be replaced nearly three years after publication because it was duplicated from a previously published article1 from her group. As requests of this kind are highly irregular and are often cause for concern, the editors determined that a retraction was in order. Good decision by Editors. Should be stamped as a good example for all journals. The head of the Swedish Medical Research Council Mille Millnert and its chairman Lars Anell are personably responsible for the death of the person operated by Michael Olausson with the help of Suchitra Holgersson by not stopping them in time. Why have they not been prosecuted?